I made a trip to my research site on Groundhog Day. Before I tell you about the trip, I’ll first give you a little background on what I actually do for my research. 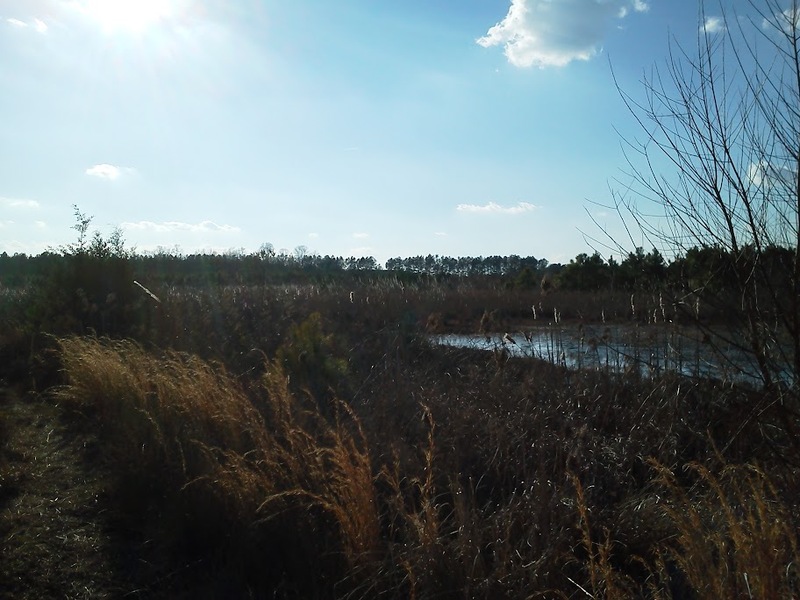 The focus of my dissertation is examining phosphorus dynamics in wetlands restored from agricultural soils. 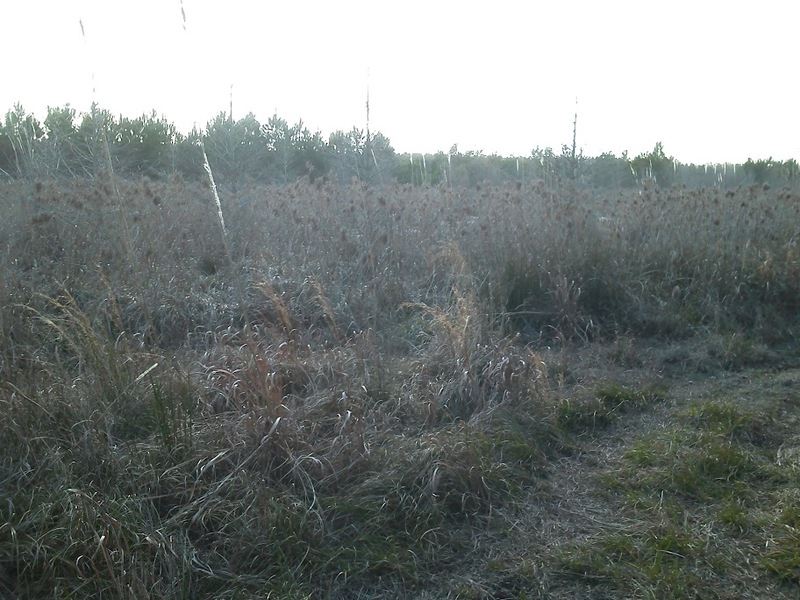 In lamen’s terms I look at the processes that change phosphorus (a nutrient) forms and locations within a wetland. 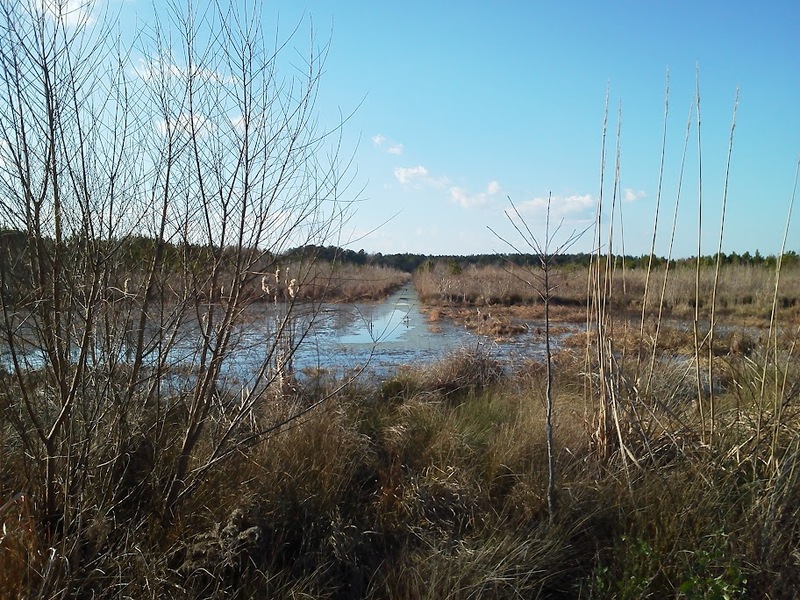 That wetland, Juniper Bay, was a Carolina Bay wetland up until the 1970’s when it was drained and converted to row crop agriculture. In 2005 it was restored back to a wetland. 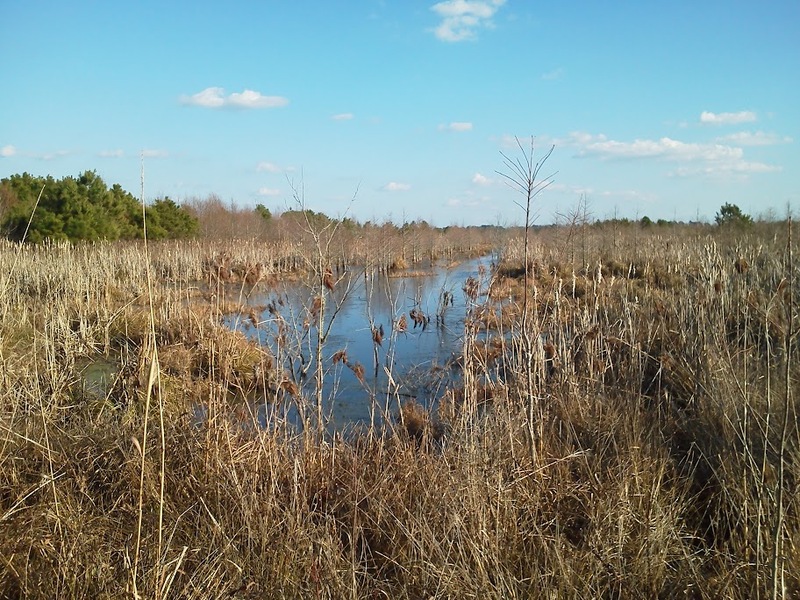 However the nutrients contained in the soil, especially phosphorus, were at concentrations much higher than would be found in similar, but undisturbed wetlands. 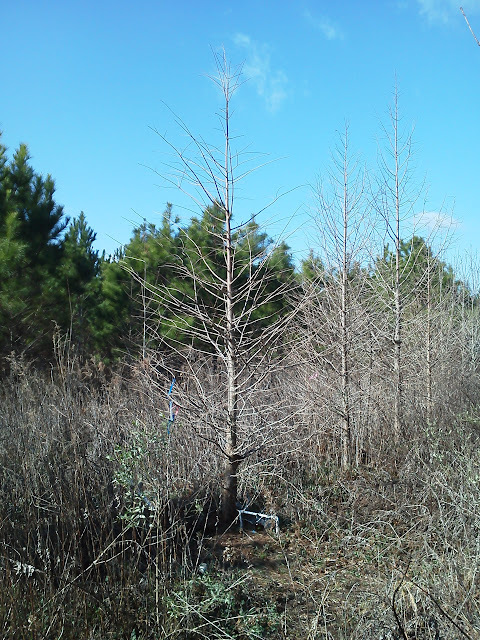 For part of my project, I am looking at how concentrations of phosphorus change in the soil pore water in the presence of alive or dead roots from bald cypress trees. I did some work in the greenhouse, and now I’m working on the field component of that research. This is my setup for taking root pictures. The tree is a bald cypress tree. To the left of it are nests of redox electrodes that measure how reduced the soil is (how anaerobic), and soil pore water samplers (called rhizon samplers). The silver tube is a rhizotron tube – a clear tube that allows the rhizotron camera (black rod sticking out of the tube) to take pictures of the roots at known depths. The camera is hooked up to a field computer and batteries. I have two tubes at eight sites (16 tubes total) that I use for root pictures. 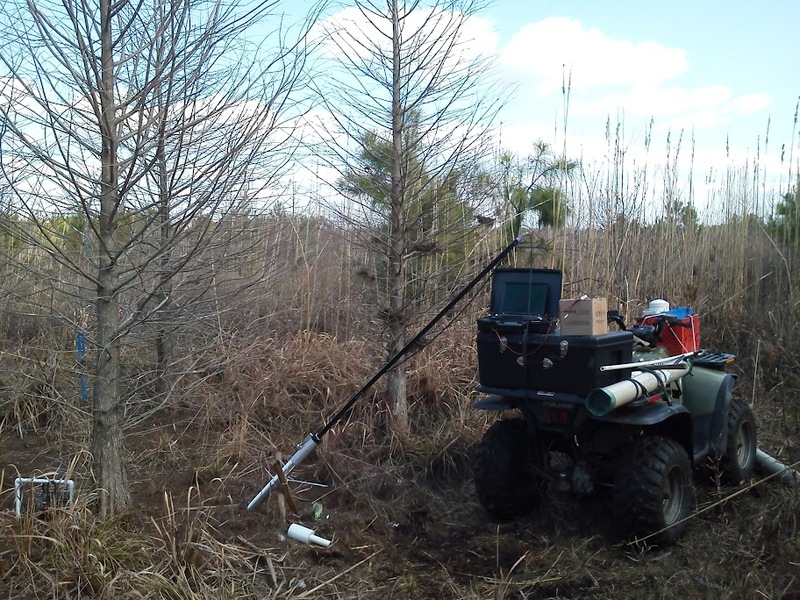 Those same trees are also instrumented with the samplers and electrodes. The eight sites are split into four sites that are on mineral soil, and four sites that are on organic soil. On our route through the wetland we have to go through an area that is low in elevation, and is thus flooded for most of the year. 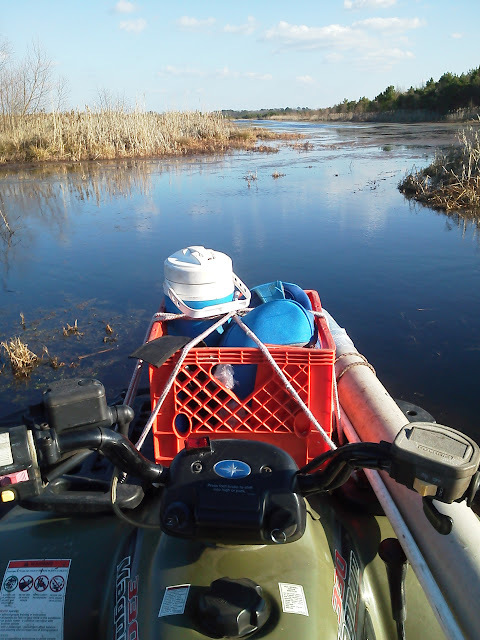 Here’s a pic of my view as I drive through water that is a little deeper than axle deep on the ATV. That location is about dead center of the wetland. The low area exists because that is where soil was borrowed to fill in the ditch that once existed to drain the site. The borrow and ditch areas are now low spots that are ponded year round in most years. Here are a few other pics from the trip around Juniper Bay. The entire Picasa album can be found at this link. Hopefully that give you a little glimpse at what I do when I go to the field. It was a beautiful February day. It got up to around 70 degrees F so I got a good head start on my 2012 farmer’s tan. 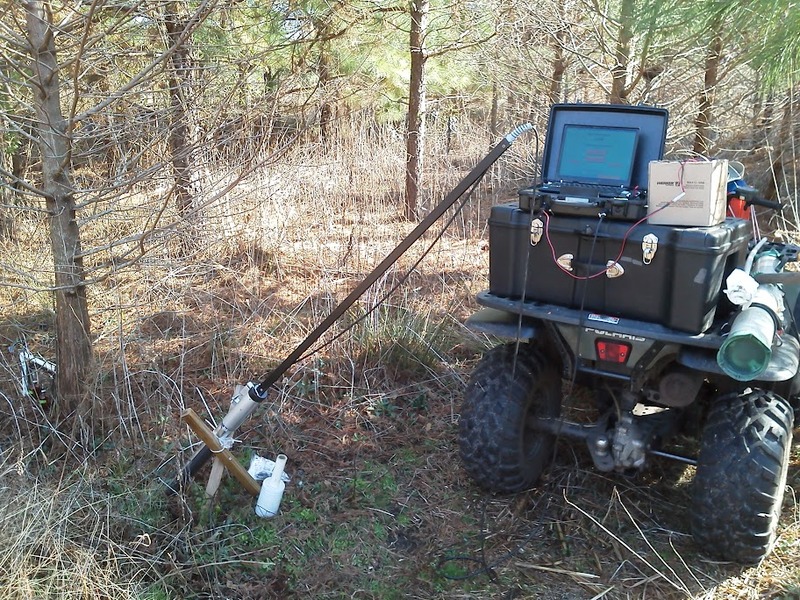 This entry was posted in Colby's Research, Field Days and tagged Carolina Bays, Dissertation, Juniper Bay, Rhizotron Camera, Rhizotron Tubes. Bookmark the permalink.